I was born in 1947 and spent my formative years in Cardiff, South Wales. At the age of fourteen I received a vivid ‘after death communication’ (ADC) from the spirit of my recently departed sister, an experience of such profound beauty which left me with an innate conviction that the soul is immortal, pure and incorruptible. This event marked the beginning of my spiritual search or journey. For I knew then what real love and bereavement meant, but not why they are visited upon us, and the world of my childhood was never the same again. Shortly after this my family broke up and by the age of seventeen I was living on the road and encountering the first wave of the counter-culture of the early sixties. From an early age I had developed a keen interest in drawing, but was refused entry to art college because I was colourblind. It was at this point that I met John Miles (1944-97), a colourful character in every sense of the word, who was to become my main artistic mentor and lifelong friend, and whom I consider to be one of the finest visionary painters of our time. Over the course of the next five years I became deeply involved in the gnostic traditions of the East, the symbolism of which profoundly inspired my artistic and creative skills. But in late 1968 I entered a psychedelically induced psychosis or ‘kundalini-crisis’ that was to last for many years and again change the course of my life. It was in this extremely volatile state of mental and perceptual distortion that I left for India and Nepal in 1970, where I was to live for the next six years. In India I studied thangka painting with several of the finest Tibetan artists living at that time: including Jampa from Lhasa, the ‘state artist of Tibet’, who lived in Dharmasala; and Khamtrul Rinpoche, a great lama and artist who established the Tibetan Craft Community at Tashijong. In Kathmandu I first became fascinated with the art and architecture of the Newar tradition, and was particularly inspired by the visionary style and painting techniques of the famous Newar artist, Siddhimuni Shakya (1932-2001). During these years I also deeply immersed myself in all aspects of Indian spirituality and culture, studying classical music (sarod) in Varanasi, and learning much from the countless sadhus, gurus, scholars, beggars and magicians that it was my destiny to meet. 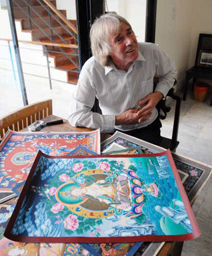 In 1976 I returned to the UK and began to eke out a living in London as an artist and illustrator, creating oriental fabric designs, the first silk-screened thangkas, and my first cover illustrations and line drawings for books. At this time there was very little understanding, appreciation or demand for Buddhist deity images, and what little there was tended to be charitable work for newly established dharma centers. But I persisted, continuing to draw and study with a devotion that bordered on obsession, until an understanding began to develop through the direct intuition of the imagery that I was working upon. The essence of the Vajrayana tradition is encapsulated within its deity symbolism, and the deeper that one penetrates into this visionary realm the more expansive is the panorama that is revealed. I have never ceased to be amazed by the incredible sophistication of the ‘Mind’, which conceived of this vast pantheon of visualized deities with their highly esoteric meditational practices. And although I would describe myself as being self-taught and living by a dharma that has no credentials, intuition has always been my greatest teacher. For ultimately the dharma exists nowhere except within our own mind, and it is mainly through direct revelation that I have really been able to comprehend and process it. I spent twenty-five years at the drawing board, often working around the clock, and the many drawings and paintings that I made during this time have appeared in hundreds of books, and now adorn countless websites and spiritual artifacts, from Tibetan prayer flags, jewelry and offering scarves, to incense packets, t-shirts and computer mats. The most ambitious projects that I have so far undertaken are a series of lineage holder drawings, which are still unpublished; and The Encyclopedia of Tibetan Symbols and Motifs, with its more concise offspring, The Handbook of Tibetan Buddhist Symbols. Shambhala Publications and Serindia Publications respectively published these two books in 1999 and 2003. Much of my finest work was done in the remoteness of the Scottish highlands, where I lived with my wife and our two daughters for ten years. In 1988 I went back to Nepal for the first time in over twenty years, and was surprised to see how much my published paintings and drawings had influenced the modern Tibetan and Newar art world there. In 1997 I went back to Kathmandu again and with the assistance of my dear friend Phunsok Tsering (1957-2008), reconnected with Siddhimuni Shakya and began to research the Newar paubha painting tradition of the Kathmandu Valley, with its unique pantheon of Hindu and Buddhist deities. Since then I have spent one month of each year in the Valley, gaining the trust, allegiance and respect of these artists as their main patron and mentor, and assembling the largest and most exquisite collection of their work. Some of these paintings I have exhibited at the October Gallery in London, the Oriental Museums of Bath and Durham, Tibet House in New York, and the Mahadevi Gallery in California. I now live in Oxford with my partner Gill Farrer-Halls, where I continue to work on my long-term project of writing upon the iconography and symbolism of the deities of both the Indo-Tibetan and Newar traditions. Yet even though I have been involved in this seemingly obscure and academic research for the past forty years, I have always tended to view it as a vehicle for my own self-realization, a by-product of the same spiritual process of introspection and analysis that began for me at the age of fourteen. It defines what I do, but not who I am. Throughout my life I have had many different mystical and spiritual experiences, some prolonged and blissful, others spontaneous and image shattering. They are part of the imaginative and spiritual landscape that I have chosen to explore and inhabit, with its vast population of peaceful and wrathful deities. All of these experiences are transitory, they come and go, they have a beginning, middle and end, and they no longer serve to condition my understanding. In 2006 my eldest daughter, Carrina, died in a diving accident at the age of 23, and from this tragedy I realized that although the Tibetan tradition is rich in its theoretical teachings on death and dying, it is actually quite impoverished when it comes to dealing with an intense grief of this nature. For the death of a child can often take one far beyond any belief system or doctrine, and it certainly has in my case. So for the past four years I have been researching the ‘afterlife’ outside of the conceptual doctrines of any religious system, and guided purely by my own intuition I have come to understand all things ‘spiritual’ in an entirely different light. And this understanding is not based upon any doctrine or dogma, but on my own direct insight and experiences of the ‘spirit world’, which I now realize is the source of the supreme intelligence, compassion, awareness and energy that permeates our multidimensional universe. And in the benevolent light of our timeless and formless existence as pure ‘spiritual beings’ the biography of anyone’s life upon this planet is ultimately as insubstantial as a dream. We are such stuff as dreams are made of, and I am only now just beginning to awaken.